Let our talented professional ice sculptor create the prefect ice sculpture for your wedding, reception or other event here on Maui. The flexibility of ice is only limited by your imagination. These beautiful ice sculptures include complete setup and break down and well as colored lighting to make your ice sculpture come alive. Our sculptor can work with you to design that one of a kind ice sculpture that will be the centerpiece of your reception. Just give him an idea, drawing or logo and your ice sculpture will come to life. 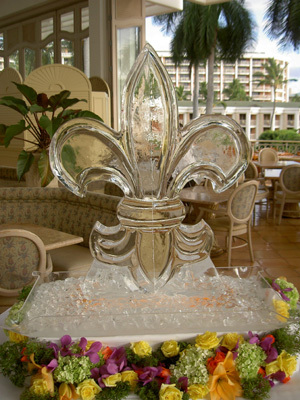 For more information about these beautiful ice sculptures, call us at 800 368-5502.